Gridflex Energy, LLC utilizes the best proven and most economical technology available for bulk energy storage today: pumped hydroelectric energy storage. Pumped hydroelectric energy storage, more commonly referred to simply as “pumped storage,” creates potential energy by pump ing water from a lower reservoir to an upper reservoir during off-peak periods. During the generation period, stored water is released to flow downhill through a turbine to produce power. Because pumped storage plants can operate flexibly and respond quickly, they can offer a variety of grid-support (ancillary) services to a utility in addition to power generation. Pumped storage has been utilized for the past hundred years. There are currently more than 120,000 MW of pumped storage generating capacity installed around the world. Several Gridflex projects involving pumped storage would utilize smaller-scale, efficient, closed-loop projects that do not involve natural bodies of water. These projects have a smaller environmental footprint and can be sited more easily and permitted more quickly. 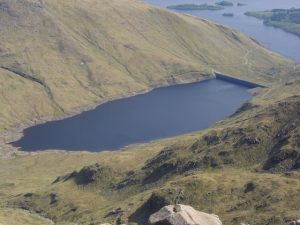 Those involving existing reservoirs or other bodies of water have been carefully chosen for lower environmental sensitivity. Good pumped storage sites have a lower cost per kWh of storage capacity than even the optimistic projections for large-scale battery projects. Pumped storage facilities have lifetimes exceeding 75 years, whereas batteries are still working toward a 15 year lifetime. With full-power storage capacities of six hours, eight hours, or more, pumped storage can easily qualify as firm peaking capacity, competing directly against simple-cycle gas turbines or even combined-cycle gas turbines. Other storage technologies cannot do this, so they are far more dependent on ancillary services and arbitrage revenues. Pumped storage facilities can provide the same level of fast-response frequency regulation service that batteries, flywheels, and other emerging storage technologies are designed for. Pumped storage facilities have among the lowest levels of “embodied energy” per life cycle. In other words, relatively little energy is used in their construction compared with the amount of energy flowing in and out of them over their lives. By contrast, batteries require a very high level of embodied energy. In sum, pumped storage facilities should be viewed as firm generating assets with the capability to provide the full range of ancillary services more quickly than gas peakers and more cost-effectively than other storage approaches.